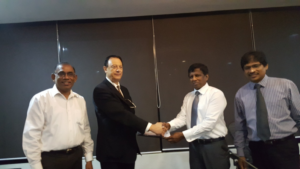 In a joint venture with TECNIC s.p.a Italy, EML signed agreement with Road Development Authority (RDA) to conduct feasibility study and develop detailed designs for the extension of Marine Drive from Dehiwala to Panadura. The objective of the study is to select a socially, environmentally and economically viable alignment for the extension up to Panadura. Accordingly, the scope of work will include detailed study and analyses of potential options, and recommendation of the most feasible option.